Buying a wedding ring should be an exciting experience. 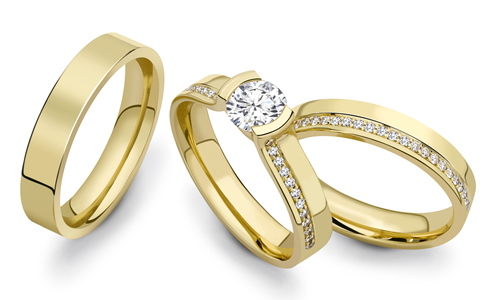 Your wedding rings are a symbol of your love for one another that will be worn for the rest of your lives. 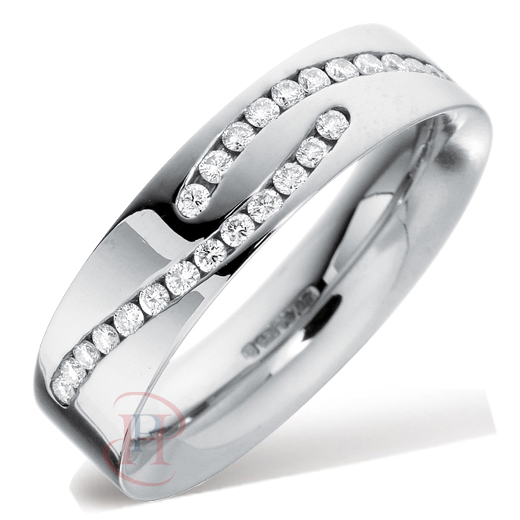 However the many different types of rings, materials and designs can also make the decision a bit overwhelming. The team at EH Warford are here to make that process more enjoybale and are happy to assist you in maing the perfect choice that suits you both. The traditional wedding ring is generally a plain band. However more and more customers are opting for diamonds and even precious or semi precious stones to further enhace the ring and indeed compliment their engagement ring.There are no rules, wedding band styles can be simple or fancy, flashy or understated. 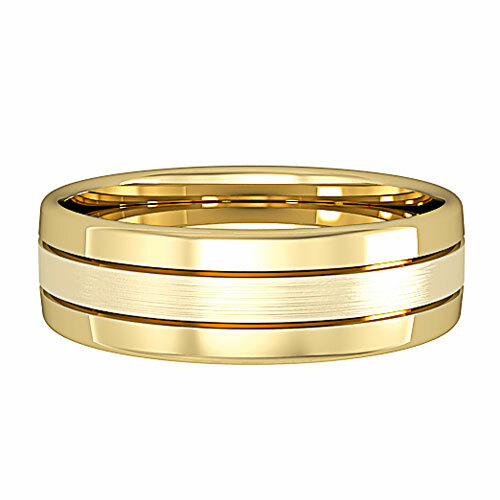 Your wedding ring should reflect your style, your personality and your taste. 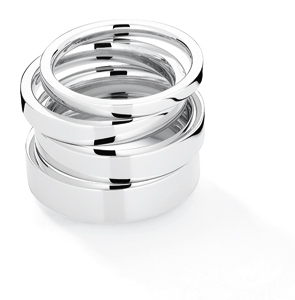 Our wedding rings are available in platinum, palladium, white gold, yellow gold, titanium and silver. 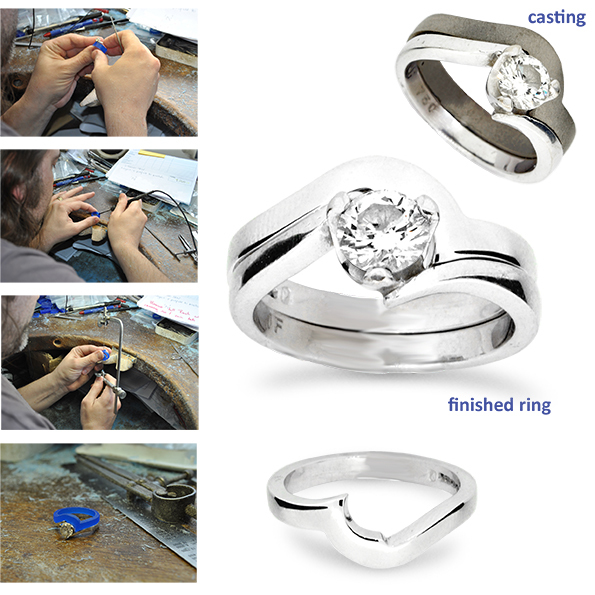 We have a large selection of popular styles, shapes, finished and metals but the choice is endless with our on-site bespoke workshop we can create the ring of your dreams. Making an incorrect decision when choosing your wedding rings might end up being a decision you regret. Whilst some problems can be corrected, many can?t, so getting it right the first time can prevent a lot of heart ache later on. Whilst buying a wedding ring might not be as simple as you may first think, with a little bit of preparation it should be an easy and enjoyable experience. These might sound like blatantly obvious points to be making, but its surprising how many people don?t get them right, especially when buying their wedding rings online or without the help of a knowledgeable of an experienced jeweller. The first point a women needs to consider when choosing her wedding ring is not applicable for men when they buy a wedding ring. 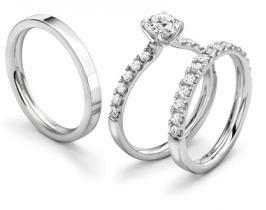 When a women buys a wedding ring she will have to take into consideration the design of her engagement ring. There are a couple of factors that she should build in to the equation when choosing her wedding ring design. 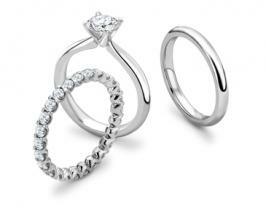 The first is that the wedding ring should complement the design of the engagement ring. The wedding ring should not distract attention away from the engagement ring. 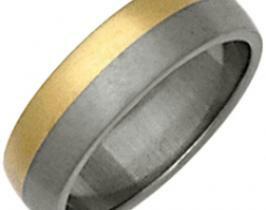 However, this is not to say the wedding ring should be plain or uninteresting. The engagement and wedding rings should appear as if they were meant to be together! 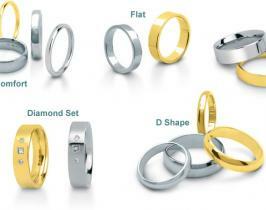 What Shape of Wedding Ring Do You Need? The next consideration is the shape of wedding ring. The main reason for considering this is because certain wedding ring designs may not be ideal when worn with your engagement ring. Obviously this depends on the design of your engagement ring. Engagement rings come in all sorts of shapes and sizes. 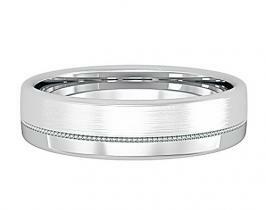 They can have a straight edged band that can easily accommodate a straight edged wedding ring design. But sometimes the engagement ring might have a curved or non-straight edge to the ring band. Also the engagement ring may have gemstones that are positioned low on the band and may restrict what shape or design of wedding ring can be worn with it. Obviously when you are shopping for a wedding ring these are things that you are going to need to take in to consideration. If you buy a wedding ring that is not compatible with the physical design of your engagement ring then you might find it uncomfortable to wear both rings together or the rings may just sit unevenly and not look good together. You may also find that any protruding gemstone settings can even cause or become damaged themselves because they contact with the adjacent ring. If you have an engagement ring that is not ideal for use with a straight edged wedding band then you will better suited opting for a curved wedding ring or a fitted wedding ring. Of course there is nothing to stop you from wearing a straight wedding ring even if it is not compatible with your engagement ring, but why compromise? Don?t forget you will be wearing your rings for the rest of your life. 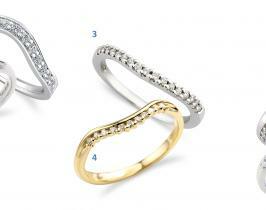 Both rings should look like they were made for each other, buying a curved or fitted ring is by far the better option. Take your time to make the perfect choice, there is an endless choice of weddings rings to choose from and you may end up regretting a hasty decision. 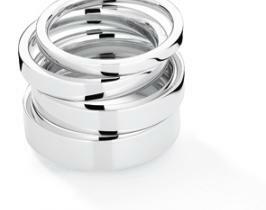 What do you need to consider when buying a curved wedding ring? Other than finding a design that complements the looks of your engagement ring, you need to consider the size and shape of the curve. 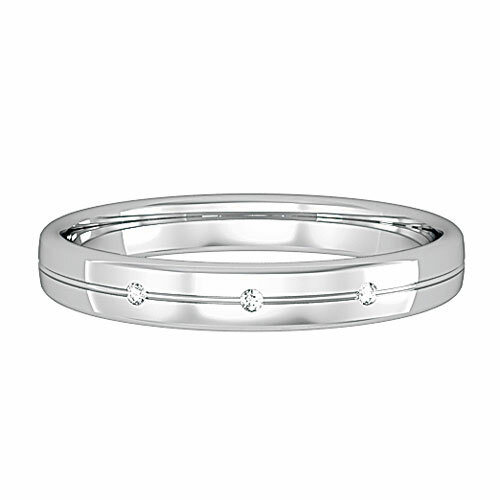 As you would expect a curved wedding ring has a straight band with a curve which would be positioned at the top to align with the gemstone(s) on the engagement ring. The curve should match the size an profile of the gemstone(s). As the shapes, sizes and arrangements of gemstones varies for engagement rings, so do the curves for wedding rings. The curves can be quite exaggerated to cater for larger single stones or can be quite gentle for smaller multi-stone engagement rings. Obviously you are aiming to find a curved wedding ring that perfectly sits with your engagement ring. The bands of both rings should be able to sit flush up against each other and there shouldn?t be any big gaps between the curve in the wedding ring and and the engagement ring. 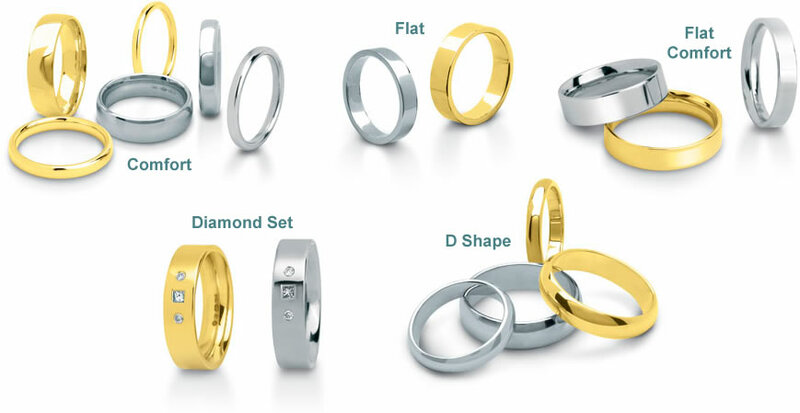 What Shape Wedding Ring is Right For Me? First of all what is meant by this. If you take a look at your engagement ring there are a few things to look at. How wide / thick is the ring band and what profile / shape of cross section does the band have (is the outer surface of your engagement ring flat or rounded?). When choosing a wedding ring, once again you should look to choose a design which compliments the design of the your engagement ring both in terms of its shape and thickness. The style of the band does not have to be identical but they will not match or fit well together if they are very different. 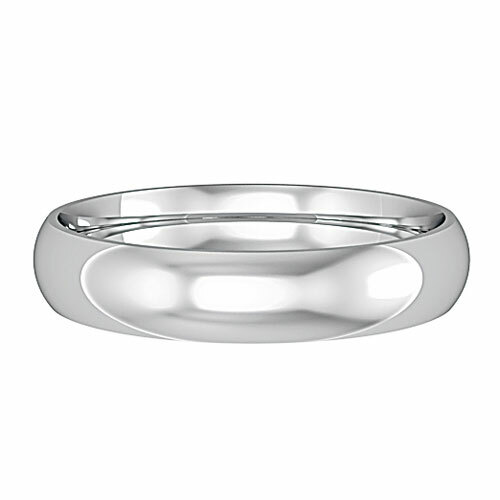 A flat wide wedding band may look a bit strange sitting along side a high domed / rounded engagement ring. Below is a list of the available profiles of wedding ring to illustrate this section. Court Profile? This profile is also known as courting or the comfort fit and it is one of the most traditional and enduring styles used for wedding rings. As you can see from the image it has a rounded outer profile and a gently rounded inside. This gives this profile its comfortable fit regardless of the width of ring that you buy (hence why it is also called the ?comfort? fit). Flat Court Profile ? This style has the same rounded-edge to give a comfort fit on the inside of the ring but has a flat outer surface which gives the ring a modern and contemporary look. Some might consider this style to be the best of both worlds, a sleek look but with a comfort fit. D Shaped ? This style has a flat inner surface with a rounded outer surface similar to the court profile. This style caters for people who prefer the rounded look of the court profile but with the flat inner surface. To remain comfortable this profile can still have rounded corners on the inner edges but without the rounded profile. 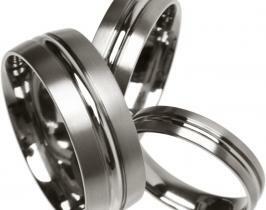 What Width Of Wedding Ring Should You Buy? The answer to this question is a relatively simple one. It should be the same width as your engagement ring or possibly a little bit wider. 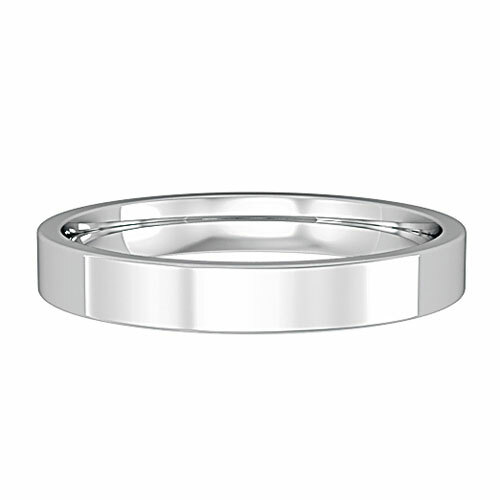 Just so that there can be no misunderstanding, we are talking about the width of the band for the wedding ring and engagement rings at the base of the rings (if the rings have any gemstone settings on the top they may be wider at this point, so compare the bands at the opposite side of the band). The only proviso here is that, the wedding ring must look proportional to the engagement ring and when they are worn together there should be ample space for them to fit on the finger between the base of the finger and the knuckle. We have been selling wedding rings for many years and are more than happy to guide and advise you on the best width and styles suited to macth your engagement ring. 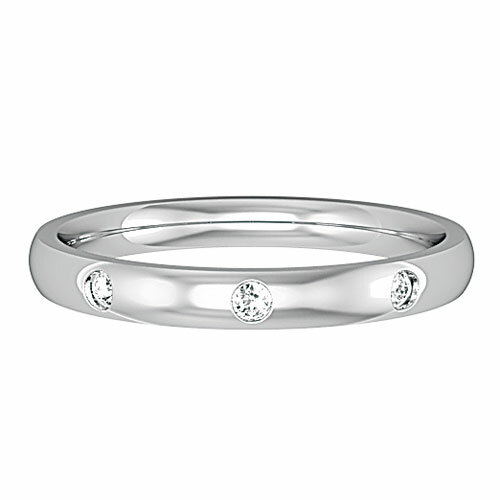 Generally speaking you should match the metal of your wedding ring to your engagement ring. For example this means that if you have a yellow gold engagement ring then you should select a yellow gold wedding ring also. 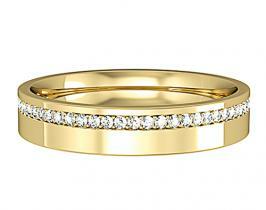 Also you would need to consider what carat gold your engagement ring is and ideally stick with the same, i.e. either 9ct or 18ct. There are a couple reasons for this. 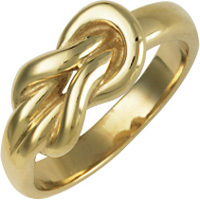 Firstly 18ct gold is harder than 9ct and may cause wear when it rubs against 9ct gold ring over time. Secondly, over time the appearance of 18ct and 9ct gold will differ as it ages. There are of course exceptions to these rules. 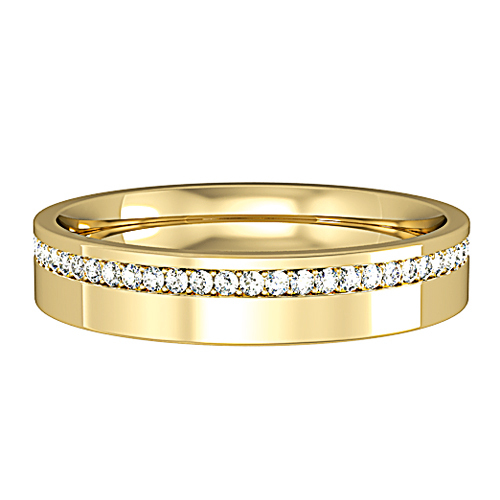 If you have an engagement ring that combines white and yellow gold you could either select a wedding ring which is made from either white or yellow gold or both. Though sticking to the same gold carat rating is still a good idea regardless of your choice for the reasons mentioned above. 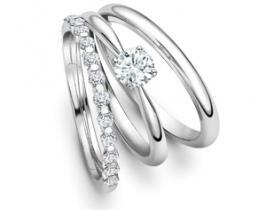 When it comes to other precious metals such as Platinum and Palladium, then the same rules apply, ideally it is best to match a platinum engagement ring by buying a platinum wedding ring. Should You Choose a Diamond Wedding Ring or a Ring With Other Gemstones? This one is down to preference and budget. There a few guidelines and helpful hints that might help if you take them into consideration before you make your choice. Firstly it is traditional for diamonds, rubies and sapphires to be used in wedding rings because they are particularly hard and durable, a quality that is essential for a wedding ring which you are expecting to wear for the rest of your life. So selecting a wedding ring that uses any other type of gemstone is probably not advisable. The good thing about incorporating diamonds and other gemstones in to the design of your wedding ring is that they will bring an extra sparkle to the design of you wedding ring. After a few years of wear and tear when your wedding ring might be in need of a professional clean and polish, the diamonds will still sparkle and make any scratches and blemishes less noticeable. 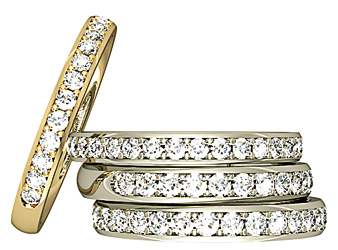 The most common arrangement for diamond (or other gemstones) wedding rings is the channel set ring. This is when the diamonds are in a row and touch each other. 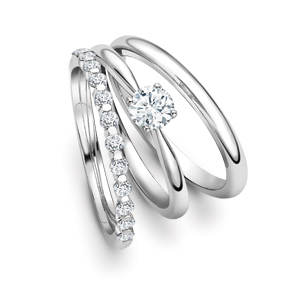 The best results can be achieved by matching the wedding ring and engagement ring to compliment each other. E.g. 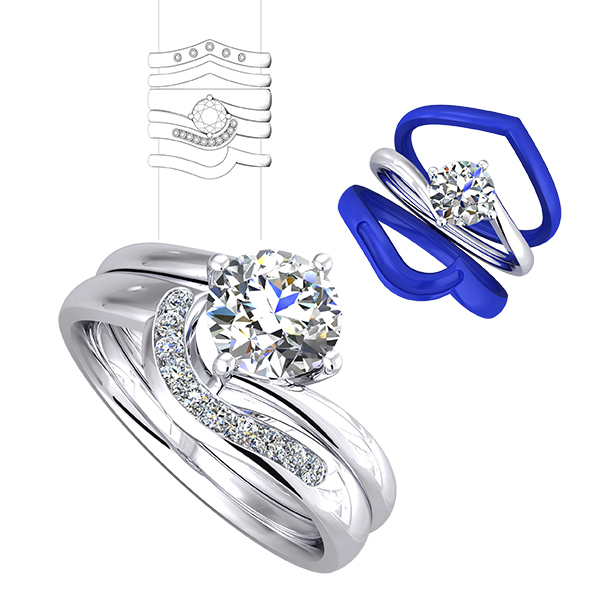 if the engagement ring includes diamonds or sapphires then select the same gems for the wedding ring. Also the engagement ring may include gemstones in any number of arrangements or settings. They could be in a prong, bar, cluster, or channel arrangements that span different distances across the circumference of the ring. The engagement ring gemstones can also sit either side of a singular or cluster of stones. The best results can be achieved by matching the settings of the wedding ring and engagement rings so that then both span across the same distance, so as to perfectly compliment each other. 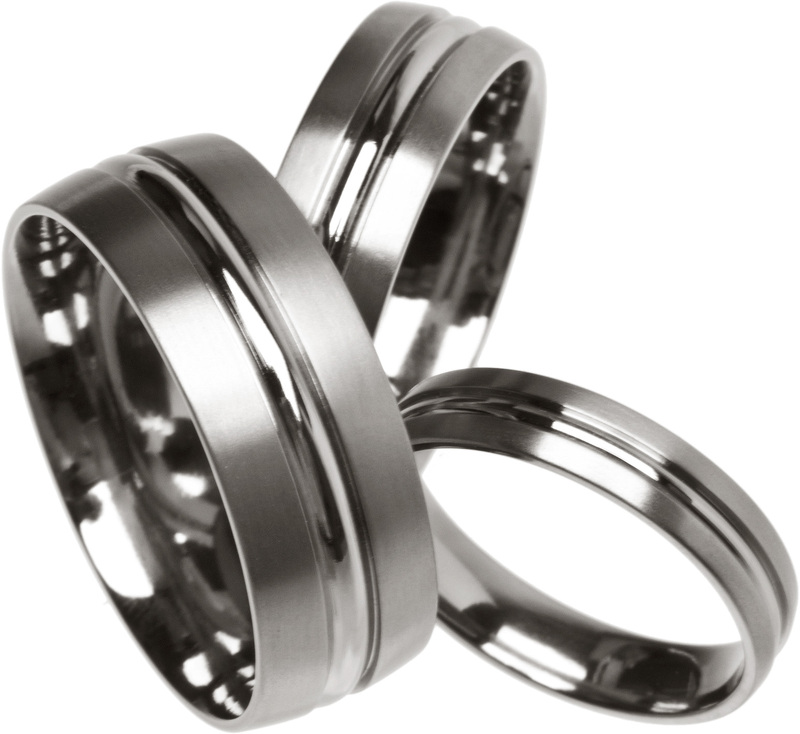 What About Matching Wedding Rings and Unisex Wedding Rings? Having matching wedding rings is becoming less popular now-a-days. Taking all of the above into consideration, the design that the bride chooses to compliment her engagement ring might not to the tastes of the groom if he were to choose a matching wedding ring. 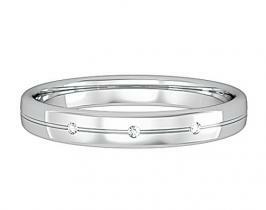 However, it is possible to choose matching or Unisex wedding rings that are of a similar or a themed design. The designs don?t have to be identical to compliment each other. This could be done by matching the metals or inclusion of the same gemstones or engravings for both the mens and ladies wedding rings. Also engraving is another popular way of adding a personlised touch to your rings by having a special message engraved on both rings. Typically speaking, for the groom-to-be the process of buying a men?s wedding ring is a bit of a daunting task. 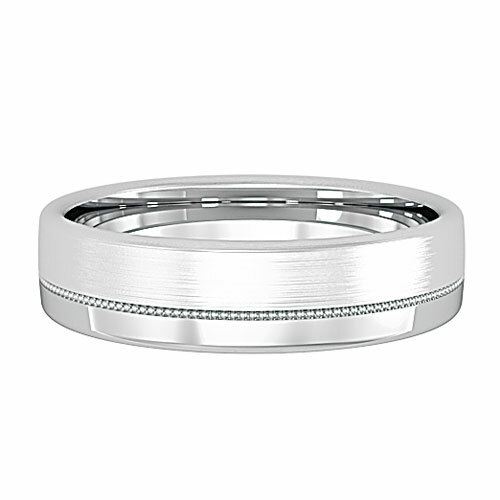 Men tend to be less interested in jewellery and so are less familiar with the terminology that is used to describe certain aspects of wedding jewellery This is before you even mention the endless choice of men?s wedding rings that are available that make it a nightmare for your average man to decide on a wedding ring design. Choosing a wedding ring obviously will include finding a design that you find attractive. But for men, their choice should also pay greater attention to the more practical aspects of design than a women might. As men tend to have more physical jobs and participate in more physical sports they need to consider aspects which relate to durability and wear-ability more. 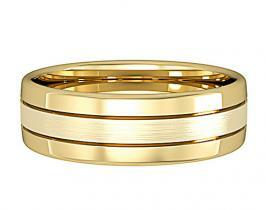 For the traditionalist there are of course the more classic designs of gold wedding bands. These traditional designs should appeal to the no frills kind of guy who has little interest for making any sort of fashion statement when displaying their wedding ring. 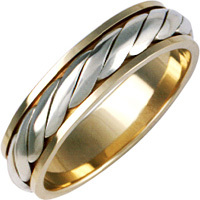 If you consider mens gold wedding rings a bit too plain looking, you can opt for a slightly more complex design by combining yellow with white gold for a two tone gold wedding ring, or by choosing a design which applies different patterns, profiles or textured finishes. 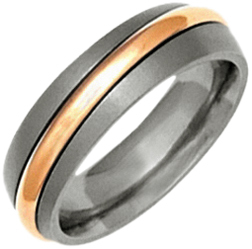 For men who are a bit more fashion aware or experimental there are many very different wedding rings designs that use certain materials that you maybe wouldn?t normally associate with wedding rings such as titanium. 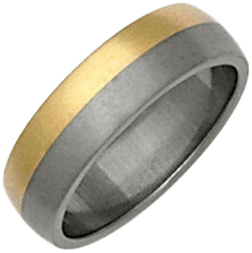 When combined with other materials as well employing new manufacture techniques, some quite radical designs of men?s wedding rings can be produced. 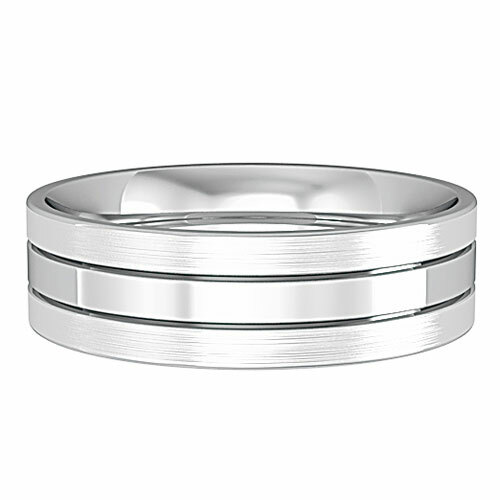 If you?re thinking about buying a ring from this category of men?s wedding rings you should keep in mind that you will be wearing the wedding rings for a long time to come. If you end up picking a design which is just a passing trend then you may end up regretting your choice.